Learn these essential kanji to make sure you buy what you want and eat what you ordered. This means, yes, by all means, go ahead and push (or pull) on the door, without fear of looking like an idiot or startling the unsuspecting staff inside. Holidays are completely irregular in Japan and a store may choose to shut on any day of the week. I was recently dismayed to find that my pilgrimage to a curry restaurant was in vain as it only shuts on… Saturdays. Make a note of the set holiday – 定休日 (ていきゅうび). Once you have successfully located and entered your chosen store, it’s time for some interior navigation. Although departments stores are usually clearly marked with picture signs, on occasions, you may need to read お手洗い (おてあらい) for toilet or even 化粧室 (けしょうしつ) for powder room in upmarket places. Also helpful are エレベーター or even 階段 (かいだん) (stairs), which may be your saviour if you find yourself faced with an elevator that never comes, very common in Tokyo due to the sheer busyness of just about everywhere. 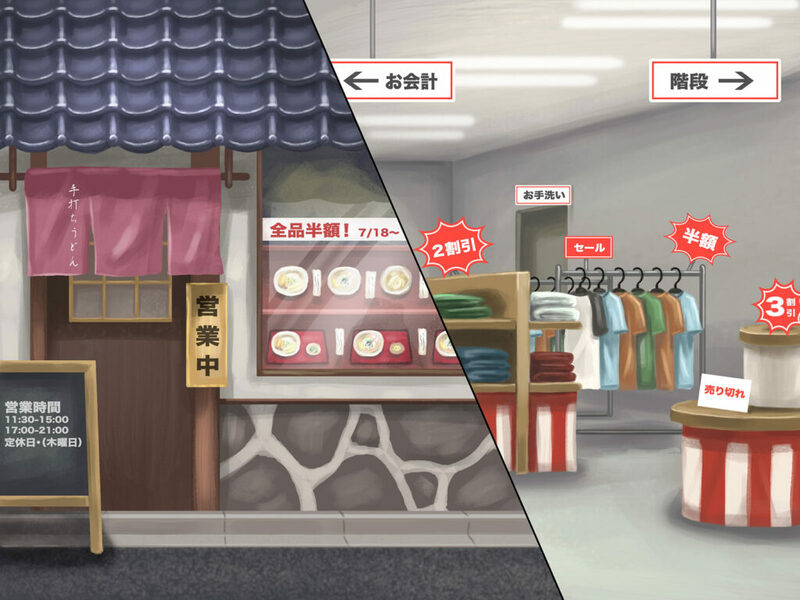 If you’re doing a bit of clothes shopping, you might need the fitting room (試着室 (しちゃくしつ)). Next, I’d like to introduce some of my favourite kanji – the kind that tell you there’s a bargain sale (バーゲンセール) to be found. Whilst both these mean ‘sold out’, 売り切れ translates to more as ‘out-of-stock’ so is more likely to be listed on items that are only temporarily unavailable. In restaurants, keep an eye out for special boards or items on the menu marked おすすめ・オススメ (recommended) as these are often advertising signature dishes and might be a lucky gamble if you can’t decide what to order… or if you have no idea what the menu says. Be grateful for the ubiquity of picture menu and plastic food displays. A good deal can also be the set meals (定食 (ていしょく)), which are especially good deal at lunch time. In some cafes, you have to clear your own table so look for these kanji so you know where to return your tray. And if you enjoyed a delicious meal, feel free to let the restaurant staff know with a ごちそうさまでした (literally ‘it was a feast’) as you leave!